Need a quick and easy weekend fix but just eating plain chocolate won’t cut it ….and you want to amp it up a tad? Just can’t beat that chocolate and peanut butter combination? Are you, like me, not willing to invest any more time or ingredients into your chocolatey treat than is absolutely necessary and prefer to use things that are in the fridge or cupboard most of the time? Nonetheless….This recipe just may be for you. This recipe makes weekend indulgence far too quick and easy to put together! Simply toast your bread and pop on a pretty plate. Spread with peanut butter and top with banana slices. This goes super well with a nice cuppa, or for some extra chocolatey indulgence, a cup of hot chocolate! How was your long weekend? Mine was packed out with an engagement party, a wedding reception, hanging out with friends and a birthday. Gotta love that extra day off! Girl, you got me hooked on this! I love choco. I love banana. and peanut butter…I’m sold! (Ugh ok, I’ve been staring at your lovely picture for too long. I think I better make one for breakfast tomorrow). Oh yum I love banana and honey as well! 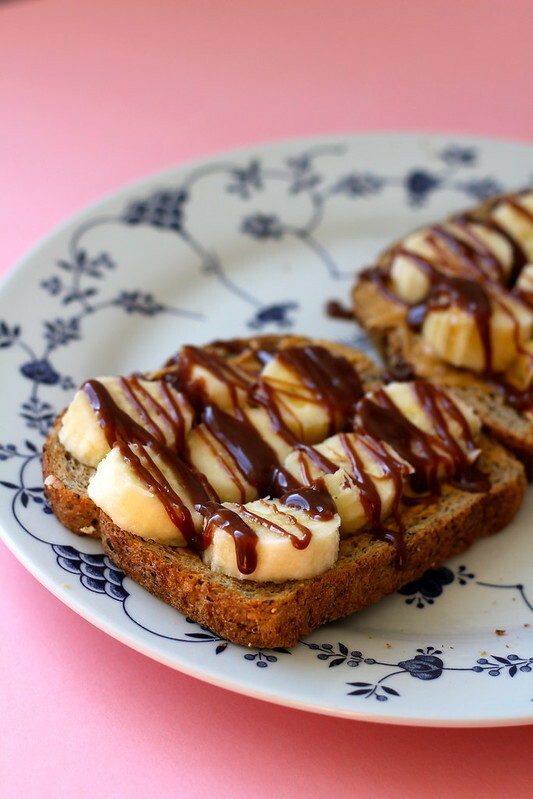 Chocolate and banana are an awesome combo…So many things go well with bananas! Thanks for dropping by Charlie! Heheh meeee too. I especially love banana & peanut butter in smoothies… Addictive! Peanut butter, chocolate and bananas are my favorite combination! Sometimes, I just eat sliced bananas with some peanut butter as a dessert. Adding chocolate to it is taking it to a whole new level. i have to confess banana on toast is my fave, i have not taken it to this level though. I do love banana on toast as well. Such a great simple combination! This is definitely a sneaky treat! Looks scrumptious. Hehe thanks for dropping by Lizzie! I love that combo as well but this certainly satisfies chocolate cravings 😀 Thanks for dropping by Erika! Oh yes please. I LOVE the look of this! I read recently that banana and chocolate go really well together. I don’t have a sweet tooth so I’m just a little nervous about the combo. This really is the best breakfast or morning snack 🙂 But because I’m not a fan of peanut butter I would substitute it with LOTS of nutella instead ~ i think nutella and banana are so amazing together! Ahhh excellent idea Daisy! Can’t go wrong with Nutella, yummm!